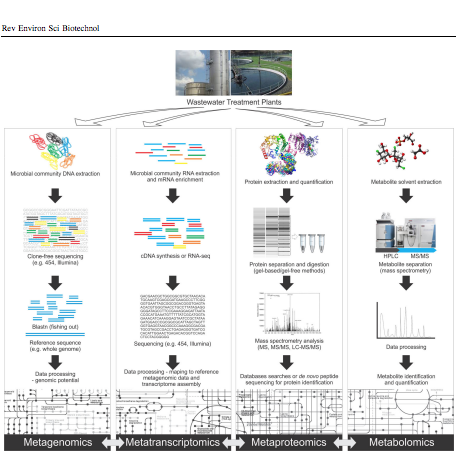 Recent Papers on microbiology of the built environment, August 3, 2015 – microBEnet: the microbiology of the Built Environment network. 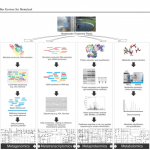 Recent papers about microbiology of the built environment and water treatment. Two of them are about fish, so here is a 70s classic rock song in a modern version, to go with this post: Barracuda by Heart and Fergie. Ammonia-oxidizing archaea (AOA), as opposed to ammonia-oxidizing bacteria (AOB), were recently identified as the dominant ammonia oxidizers in most freshwater aquaria. 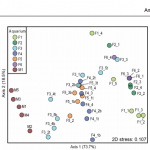 This study investigated biofilms from fixed-bed aquarium biofilters to assess the temporal and spatial dynamics of AOA and AOB abundance and diversity. Over a period of four months, ammonia-oxidizing microorganisms from six freshwater and one marine aquarium were investigated at 4—5 time points. (…) Quantitative PCR (qPCR) for bacterial and thaumarchaeal ammonia monooxygenase (amoA) genes demonstrated that AOA were numerically dominant over AOB in all six freshwater aquaria tested, and contributed all detectable amoA genes in three aquarium biofilters. (…) Denaturing gel gradient electrophoresis (DGGE) of thaumarchaeal 16S rRNA genes indicated that community composition within a given biofilter was stable across media types. 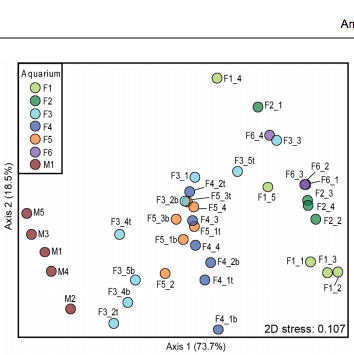 In addition, DGGE of all aquarium biofilters revealed low AOA diversity, with few bands, which were stable over time. Nonmetric multidimensional scaling (NMDS) based on denaturing gradient gel electrophoresis (DGGE) fingerprints of thaumarchaeal 16S rRNA genes placed freshwater and marine aquaria communities in separate clusters. 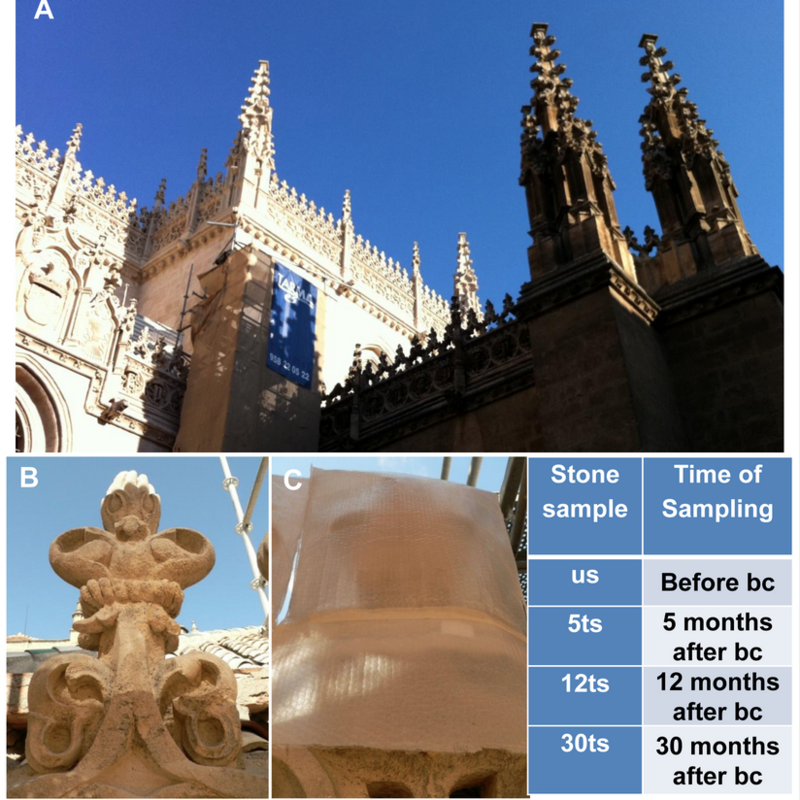 Biomineralization processes have recently been applied in situ to protect and consolidate decayed ornamental stone of the Royal Chapel in Granada (Spain). 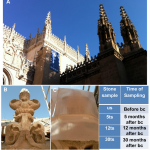 (…) Here, we report molecular monitoring of the stone-autochthonous microbiota before and at 5, 12 and 30 months after the bio-consolidation treatment (medium/long-term monitoring), employing the well-known molecular strategy of DGGE analyses. (…) The results clearly show that, although a temporary shift in the bacterial and fungal diversity was observed during the first five months, most probably promoted by the application of the bio-consolidation treatment, the microbiota tends to regain its initial stability in a few months. Thus, the treatment does not seem to have any negative side effects on the stone-autochthonous microbiota over that time. The molecular strategy employed here is suggested as an efficient monitoring tool to assess the impact on the stone-autochthonous microbiota of the application of biomineralization processes as a restoration/conservation procedure. 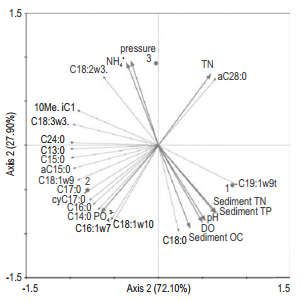 Microbial communities in three drinking water reservoirs, with different depth in Xi’an city, were quantified by phospholipids fatty acids analysis and multivariate statistical analysis was employed to interpret their response to different hydrostatic pressure and other physico-chemical properties of sediment and overlying water. (…) Three drinking water reservoir sediments were characterized by microbial communities dominated by common and facultative anaerobic Gram-positive bacteria, as well as, by sulfur oxidizing bacteria. 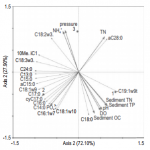 Hydrostatic pressure and physico-chemical properties of sediments (such as sediment OC, sediment TN and sediment TP) were important effect factors to microbial community structure, especially hydrostatic pressure. (…) This research supplied a successful application of phospholipids fatty acids and multivariate analysis to investigate microbial community composition response to different environmental factors. 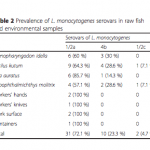 The aim of this study was to investigate the prevalence and characterization of Listeria species and Listeria monocytogenes isolated from raw fish and open-air fish market environments. Eight hundred and sixty two samples including raw fish and fish market environments (samples from workers’ hands, workers’ knives, containers and work surface) were collected from the open-air fish markets in the Northern region of Iran. Listeria spp. was isolated from 104/488 (21.3 %) raw fish and 29/374 (7.8 %) of samples from open-air fish market environment. (…) The Listeria spp. isolates showed high resistance against tetracycline (23.3 %), penicillin G, and cephalothin (each 16.5 %). Besides, we observed significant resistance level to tetracycline (27.9 %), ampicillin (20.9 %), cephalothin, penicillin G, and streptomycin (each 16.3 %) in the L. monocytogenes isolates. 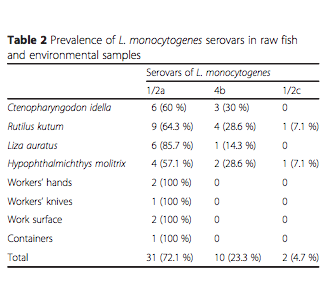 (…) Recovery of potentially pathogenic L. monocytogenes from raw fish and environment of open-air fish market samples in this study is a convincing evidence for the zoonotic potential of listeriosis. Last month, California’s KTLA reported on a nightmare situation faced by a family in Pomona. According to the news report, the family first noticed a substance oozing in their home that they attempted to remove, but it kept returning. The family had multiple companies come to inspect the home to try and locate any water leaks or other causes that could be behind the unusual situation. No leaking pipes or other moisture sources were found, so the family decided to open the wall and discovered mold inside the wall cavity. The fungus that was discovered is commonly known as Poria and it is not new to California. As far back as 1998, the Los Angeles Times published an article about Poria destroying wood materials in people’s homes. 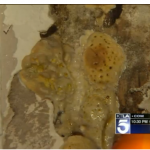 The article quoted a UC Riverside professor as stating that Poria is the most devastating wood-decay fungus of houses. 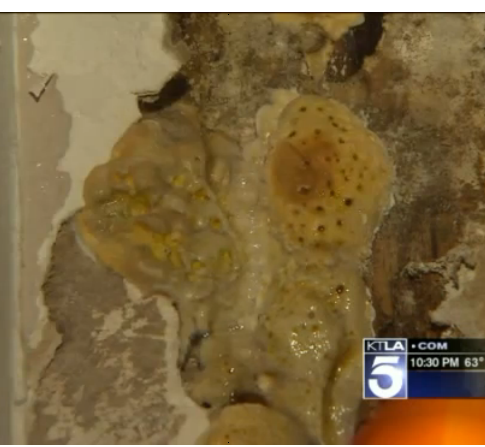 There is even a KTLA video about this case, which shows the fungus in all it’s splendid pancake batter-ness – definitely cool to watch.